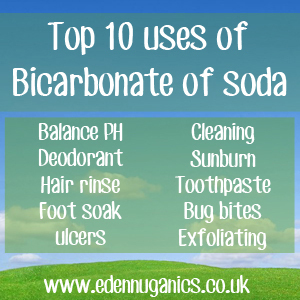 Bicarbonate of soda has a long history of medicinal use dating back over 200 years. First discovered in the year 1800 by two students of the college of medicine in Berlin, it wasn't long until bicarbonate of soda had spread across Europe and made its way from England across the Atlantic to the new world. Today in modern times we are still finding new and exciting applications for this age old remedy; so whether you are looking for a natural toothpaste alternative or a treatment for a bad case of sunburn, bicarbonate of soda could be just the thing! Fluoride free toothpaste:Toothpaste is something we all need to use, but there is a growing concern regarding the safety of many common brands of toothpaste due to a substance known as fluoride which is added to strengthen teeth, (which it does very effectively by the way) but there has been many reported cases of 'fluoride poisoning', a side-effect of too much fluoride in the diet. This is caused by a gradual build up of this substance in the body over many years which, in some people, can causes many health problems. It is also often added to the public water-system in many countries and this, added to daily use of toothpaste etc. can be quite over-whelming to our systems. Using bicarbonate of soda as a replacement is a great way to combat this problem. Not only does bicarb leave your mouth feeling clean and combat bad breath, but also helps to whiten your teeth. Sunburn relief:Practically everyone has experienced sun-burn from time to time in their lives. Even prudent sun lovers can get caught out sometimes. If you don't like the idea of acting like a human radiator for a few days afterwards, a great tip is to apply bicarb of soda to the affected area. Simply add 1 cup of bicarb to a lukewarm bath or apply to the affected area using a cold compress for instant results. Treatment of insect bites:This is our go to remedy when dealing with bug bites and with good reason. Although it is hard to enjoy a summers evening whilst unwanted guests feast on your blood, it's the following day after a night of scratching and itching that you really start to notice the bites. To combat this, make a paste of bicarbonate of soda and a tiny amount of water and apply to the problem areas. Not only will this stop the itching, but also help to reduce swelling and fight any infection. Skin exfoliant:Many shop bought exfoliants can be too rough for delicate skin types and often contain toxins and preservatives that make them far from ideal for daily use. Bicarbonate of soda can be mixed with water to form a powerful exfoliating paste that wastes no time in removing unwanted build-ups of make-up and cleansing facial pores without any unwanted harsh side-effects. All-natural deodorant: Another highly popular use of bicarb of soda is as a natural deodorant. Ever since the 1800s bicarb has been used as a way of keeping nasty odours under wraps and it seems body odour is no different. Simply apply a dusting of powder to your underarms after a shower and allow it to absorb, this will help to reduce perspiration and absorb any nasty smells. Help balance pH levels:Due to modern diet and unhealthy lifestyle options our bodies are often left in an acidic state, this is very detrimental to our health as pathogens tend to thrive in more acidic environments and the human body is more healthy in a more alkaline state. Taking bicarbonate 1/2 teaspoon of bicarb of soda daily in a glass of water is a great way to keep our pH levels in an optimal state of around 7.35 - 7.45 pH. Bicarbonate of soda hair rinse: Over time, the use of shampoos, conditioners and styling products on our hair can result in a build-up of residue leaving our hair looking somewhat lank and unshiny even right after washing. There are a number of ways to combat this issue, but one of our favourite methods is the use of bicarbonate of soda and apple cider vinegar as a replacement for shampoo. Its worth noting that this can be harsh to the skin of our scalp so only use this treatment once a month. Invigorating foot-soak:After a long day on your feet there is nothing better than relaxing whilst soaking your feet in warm water, adding bicarbonate of soda to the mix not only helps soften the skin but also removes unwanted foot odour. In addition, by doing this every day, it's possible to reduce build-up of hard skin often found on the sides of toes due to ill fitting footwear. Stomach ulcers:Ulcers are a very common problem in this hectic modern world we live in, with a large percentage of the population suffering from one at some point during their lives. Not only are stomach ulcers painful, but they can also be hard to treat, bicarbonate of soda is a great way of reducing the pain associated with stomach ulcers as it protects our stomach lining from being damaged by excess acids. This is again due to the alkaline effect that the bicarbonate of soda has. Household cleaning:When it comes to natural cleaning products there are a lot of great options, but the top two champions without a doubt are vinegar and bicarbonate of soda. Bicarb of soda can be used to remove tough grime from cooking pots, remove unwanted odours from the refrigerator, added to laundry for extra freshness and the list goes on. (Bonus!) Cleaning Silver:Over time oxidation (exposure from oxygen in the air) causes a black tarnish to appear on silver. You can buy all sorts of cleaning products but they tend to be expensive and sometimes are very smelly, harsh chemicals. Fancy doing a little fun experiment?! Lay your jewellery in a bowl covered in a sheet of tinfoil. Add boiling water and some vinegar, then add the bicarbonate of soda and watch a wonderful bubbling chemical reaction happen before your very eyes! You can see afterwards all the black tarnish sitting in the water as it has been removed by the bubbling action of the bicarb mixing with the vinegar. It's so easy to do, requires zero elbow grease and is fun too!